The Atlas CareMap and CareMap Workshops are leading to a new understanding of care ecosystems in society. The head of a family caregiving support agency, having served her community for decades, volunteered to help facilitate a few workshops. Afterward, she commented that she now has a very different perspective on the needs of her community. A social worker whose work is focused on advising family caregivers, after drawing her own family’s Atlas CareMap, realized that she and her sisters had been wrongly criticizing their brother for years. She saw that he, in fact, had been carrying almost all of the load of caring for their parents. She said she needed to call him immediately to apologize and tell him how much she loved him. Such increased self-awareness and deeper understanding of community needs is leading experts to rethink current approaches to assessing and supporting family caregiving and to try to envision new, more appropriate and useful, approaches. 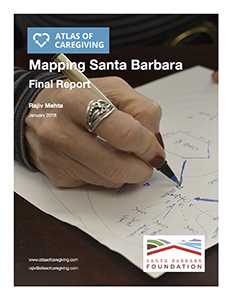 Throughout 2017 a project in Santa Barbara County, California explored the adoption and impact of Atlas CareMaps amongst health professionals, community volunteers, and the general public. The combination of deeper self-awareness plus opening the door to social, peer-to-peer conversation has resulted in uncovering community wisdom and strengthening community bonds. Local leaders describe the impact as nothing less than transformational. A series of blog posts summarized the findings; you can also download the full Mapping Santa Barbara final report. In May 2018, a year after their initial exposure to Atlas CareMaps, several community volunteers describe the nature and extent of its impact on their lives. 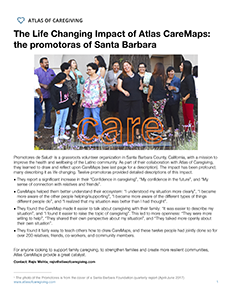 You can download these findings: The Life Changing Impact of Atlas CareMaps: the promotoras of Santa Barbara.